The optional BD FACS™ Universal Loader automates sample handling, enabling rapid processing of multitube racks and microtiter plates in this single unit. Designed to be easy to use and flexible, this option supports walkaway operation for busy research laboratories. To ensure simplicity of operation and improve experimental input flexibility, the Loader is designed such that both tube racks and microtiter plates fit into the same compact SBS footprint. The BD FACS Universal Loader software reads barcode labels on tubes and plates when used with a 30-tube rack, matrix-storage tube rack, and all supported microtiter plates. In laboratories that handle high volumes of diverse samples, this helps minimize errors due to mismatches of samples with the assays to be run. A powerful imaging system in the Loader matches the live image of the sample carrier type loaded into the system with image data stored in the system. This reduces potential errors by verifying that the sample carrier matches what was specified for the user in the worklist, ensuring that tube racks or plates are loaded correctly, and that lids of microtiter plates have been removed. Functional status indicators present on the Loader notify users about loading and unloading status of devices to further support walkaway operation. An orbital shaker built into the Loader vortexes samples in tubes or microtiter plates. This design maximizes flexibility so that users can load prepared samples onto the Loader without needing to manually resuspend them. A selection of mixing frequencies, optimized for multiple types of cells, ensures adequate mixing while preserving the cellular viability of the sample. 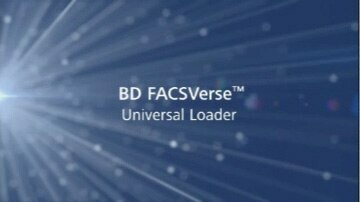 The BD FACSVerse system was designed to ensure that the customer experience was equivalent with or without the BD FACS Universal Loader option. To maintain the system flexibility, the manual station is always accessible, even when the Loader is present. The Loader is designed to keep the footprint as compact as possible and is ergonomically situated so that the system workstation is to the right. The Loader’s indicator lights and warning systems have been designed to ensure that a user seated at the workstation can easily see the Loader status. A Normal human blood was labeled with CD8 FITC/CD16+56PE/CD4 PerCP-Cy5.5/CD3 APC/CD19 PE-Cy7, and plots were gated on lymphocytes. B Normal human blood was labeled with CD8 FITC/CD16 PE/ CD4 PerCP-Cy5.5/CD56 PE-Cy7/CD19 APC/CD3 V450, and plots were gated on lymphocytes.